Encourage creativity with this sturdy addition to loose parts play on which children can post, thread and join various materials. Support children's learning through STEAM (Science, Technology, Engineering, Arts and Mathematics). Provide a range of resources for children to manipulate and experiment with. Simply clip the sides together. Accessories not included. This works together in conjunction with the Loose Parts Activity Unit (EY10767) and can be used with the Activity Unit Loose Parts Collection (EY10768) where children can be encouraged to experiment, investigate and explore. Provide a range of material for children to use alongside the Activity Centre. 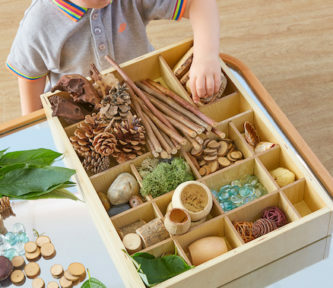 This may include connecting resources such as pegs and tape, water play equipment such as measuring jugs and channels or weaving resources such as ropes and scarves or even natural resources such as twigs and leaves. 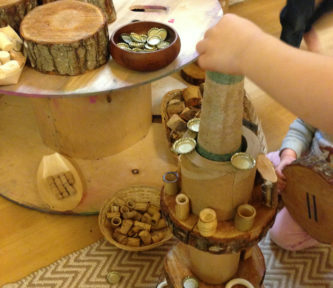 The varying surfaces are great for open ended play as each time something unique can be conjured from found materials. Provide mark making tools and materials for children to use as they design the Activity Centre into a den, a sculpture or a machine. Encourage children to be engineers, architects, mathematicians and scientists as they explore and discover. Further support children in their problem solving, predicting, changing strategy and making links by asking thought provoking and open ended questions.